There may be many occasions where you would have wanted to turn OFF your laptop monitor immediately but where stuck with no other option other than the default Windows power scheme to do it for you after a specified time. To day let us find out how do we get this done. This question was asked by my reader Nathan. 1. Go and download MonOff program from here which is authored by Kieran. 2. Once you have downloaded the program, copy this program in a directory and create a shortcut for it. 3. 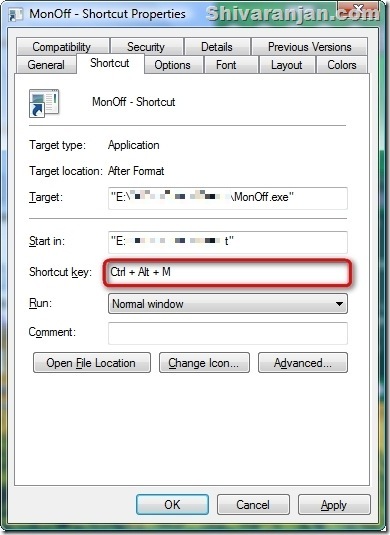 Now right click the shortcut that you created in step 2 and assign a hotkey. Here for example I have chosen Ctrl+Alt+M. 4. That is it now when ever you want your laptop monitor to be turned off all you need to do is press the hotkey and the monitor gets turned off. If you want to turn ON your monitor just use your touchpad or press any key and your monitor would come back to life. You can also use application launchers like Launchy to get this job done. This feature is available in many softwares that manage windows power management but I wanted a program that would do just what I wanted it do.